This trek starts with a couple of nights in Kathmandu. We will check your gear, help you source anything you might need (or advise you what you could usefully leave behind), show you some of the sights of Kathmandu and spend a couple of hours making sure you are fully-briefed on what to expect 'out there'. There could also be time for some good eating and drinking? With our own jeeps we drive to Pattale to start the trek. It does take about 8 hours but the road is quite good now, if a little windy towards the end. Pattale is Dorje, our guide's, home village. It has a beaut clinic funded by our friends in Australia. We will spend two nights here, especially as we arrive mid to late afternoon on the first day. This will also aid with acclimatisation as we are at 2800 metres. Dorje, Akal, Rames, Ram.....lots of our guys come from here. After two nights we head off on trek. From the moment you walk out of Pattale village the views are stupendous. You can usually see Everest in the first five minutes. 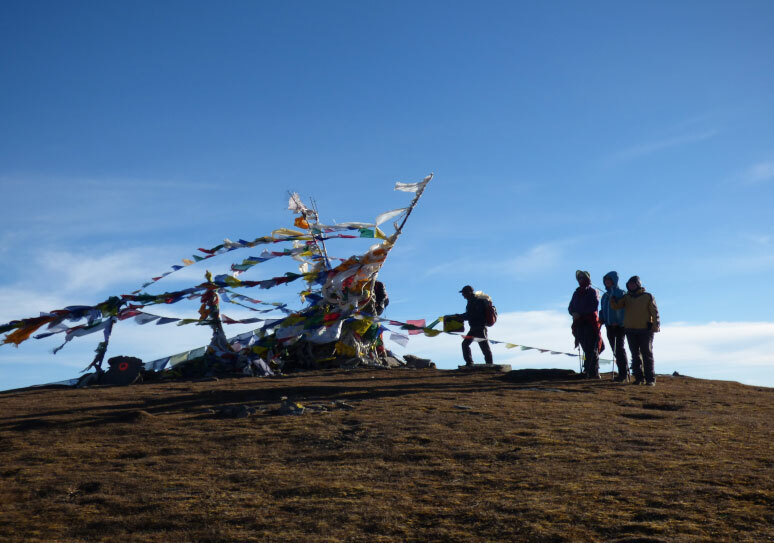 The trekking is relatively easy, not too steep, not too far each day, no serious altitude considerations. OK, the lodges can be a bit basic. The positive side of this is that not many people come here trekking and we will nearly always have the trail to ourselves. Having just finished a trek to Gokyo over Namche Bazzaar I can tell you that this is a blessing. After a few nights 'on the road' we arrive at Dairy, now more commonly referred to as Pike Base Camp. Pike is small so don't get excited. Just 4300 metres. Last season we walked up to the summit in an hour or so after lunch. It was stunningly beautiful. 360 degree views. The entire Himalayan range from distanct Daulaghiri (possibly even the Anapurnas) all the way through the Everest range to Kanchenjunga. All this with an ocean of cotton wool clouds floating below us. The descent next day, after a short but brutal ascent, was quite long and tricky so if anyone is struggling at all we will advise they retreat the way we came (easy) and take the local jeep and meet us in Jumbesi. (With your personal porter of course). We will spend a night half way to Jumbesi and then trek in the next day. Jumbesi is a beautiful historic old village on the main Jiri to Everest trail. It has some great lodges. The Apple Garden has been reasonable but I found a gorgeous renovated monastery building last season which has been made into a lodge. I would hope we could try it. Zambala! It is behind the gompa if anyone is looking for it. The next few days are lovely through dense woods then open sunny hillsides. A lunch stop called Everest View then overnight at Ringmu which has local cheese. (Better than you would expect). From here we made a super day-trek last season up onto the ridge above Taksundo La. We may have once more reached around 3500 metres. Certainly a great view from the top. The last day is gently downhill all the way. Can be a bit warm and dusty towards the bottom but by late November we are happy to trek in warmer weather. We walk down to the airstrip at Phaphlu as we hope to fly out the next day. It is a much safer airstrip than Lukla, especially when heading back to Kathmandu, i.e. OUT of the mountains. So here is the proposed itinerary. Remember please that these plans are not written in stone. All kinds of things can and do happen in Nepal on trek. Weather, health, trail hazzards. We will make sure you have a great time no matter what order you see things in. If you let yourself enjoy each long lovely day as it unfolds and not stay too fixated on reaching a particular destination I am certain that you will have a memorable holiday. Arrive in Kathmandu. You let us know when you are arriving and which airline and we will be at the airport to meet you. We will stay outside the downtown area as it can be a bit of a circus best left till last. We will walk into Bouda in the evening for dinner. Stretch those legs after a long flight. This day is always a little chaotic. We will have a look at your gear. See if you are under or over-prepared. Guided shopping in Thamel the backpacker district. Lots of inexpensive trekking gear options. I like real gear for pants and boots but a lot of things are ok when faked. What is a fake fleece? Its a fleece right. You can do some banking (cash for me would be great), a bit of pocket money for the trek (there are almost no shops), some snacks to keep you going when lunch is just an hour too far away. In the evening we will have a pre-trek briefing and give you as much info as we can about the lodges, the trail, the loos, etiquette, photos, even a short lesson in Nepali language. Pack your bags we have an early start. It is great to hit the road really early. 5 am is ideal and then we are out of the Kathmandu Valley before everyone gets going in the morning. It is a long way but endlessly fascinating. In November the temperatures are mild and sometimes the views are stunning. We will be in our own jeeps so can stop when and where we want or need to. Overnight at Pattale 2800 metres. We can spend the day exploring Dorje's village. The clinic, the high school, another nearby school, all the while acclimatising. You may well get your first look at Everest this morning. Off on trek. It is not that hard here and we may well start off for the first hour on the road. (We did last season because of recent rain). Our first overnight is Japhre. The lodge has basic little cabins overlooking a valley full of cotton-wool clouds at the end of the day. Just a few metres from the lovely old monastery which we were welcome to visit. Good cooking too! DAY 6: Nov 16: The walk today is not hard and passes by some nice old stupas and mani stone walls. The lodge at Lamuje has just been built by Kancha. Previously it was a long hard day from Japhre to Dairy, now we can stop half way. The lodge is quite simple but clean and functional. Kancha's wife Durga came up from the village to cook for us last season....with great results. We have now bought a big wood stove for the dining room. DAY 7: Nov 17: The big day. It is a long but very gradual climb to Dairy (the name comes from a local cheese factory). The lodge itself is rather cold and bleak but the owners are friendly and do their best with what is to hand. We all have torches, warm down jackets and sleeping bags, etc. so we kind of take care of ourselves. After lunch we ambled very slowly, up to the summit of Pike. It is not hard and takes only an hour or so. The views around 360 degrees are absolutely marvellous. This day is probably a bit harder than you would imagine. Descending, yes, but not immediately. The environment changes with elevation. Above the trees, then in a jungle of woody rhododendrons. Jastabanijang is another simple but delightful little lodge. Tiny wooden cublicles for rooms but lots of running water and a sunny outdoor terrace. Another of our longer days. Downhill nearly all afternoon on some fairly tricky broken trails. We could arrange for anyone struggling after Dairy and the peak to make a 'tactical retreat' and jeep to meet us at Jumbesi. At Tactor the land becomes lush and soft and covered in grazing cows. Hopefully we have enough energy to trek on to Jumbesi as Tactor's lodges don't look that inviting. Jumbesi is lovely. DAY 10: Nov 20: We will take a rest day here. You have the possibility to trek out to the Thubthen Cholu Ani Gompa, Monastery. It is a couple of hours uphill but on a gently ascending jeep road. Or you can just dag around the village, wash a few smalls, and watch the locals singing to their oxen as they plough. DAY 11: Nov 21: My favourite day on this trek. Uphill for a couple of hours through a mix of sunny jungle thickets and darkly shaded woods. You will break out of the woods onto open grassy hillsides near Everest View. Name says it all. Great lunch stop and then beautiful easy meandering trek to Ringmu after lunch. Actually, the last twenty minutes is a bit of a pig so be prepared on tired legs. We may stay at Ringmu for another night. The plan is to trek to Taksundo La next day but it can be a cold and windy place so we will play it by ear. If weather is fine we may go on. Staying at the same lodge in Ringmu while we go out for a fab day-walk to a nearby ridge also worked well last season. To be decided. The chips at Ringmu are really good! Wherever we stayed last night we are trekking down to Phaphlu today. It is a bit closer from Ringmu. The way is easy and downhill. It is a jeep road but due to its rapid deterioration there is hardly any traffic. We jeeped it last April and I think we could have done better on foot. Phaphlu is back at 2500 metres. Warm and with a good lodge. Our flight back to Kathmandu should leave from here next morning. I say should because this is Nepal. Often they don't fly when it is cloudy. Their clouds have rocks in them! Flight back to Kathmandu. Up to the customers. Some like the quiet of Kapan but some want shopping action. We will set you up with what you want. I am staying far from the madding crowd! Go Home. I realise that some airfare deals will not permit you to leave or arrive on certain days. We can live with that. Let us know in advance and perhaps pay a bit for extra days. We will work something out. We will get you to the airport for your international departure in good time. I am asking $2650 AUD for this one. All inclusive land cost. International connections to Nepal are for you to decide yourself. The trek is fully-escorted. I have done this for 18 years now and I will be coming with you. Unlike many other trekking companies, our guys carry just one rucksack each. He becomes your personal porter and walks and talks with you every day on trek. He will have good clothes and shoes and be well-paid and insured. You would really be expected to give this guy a tip at the end. Something over $100 would be appropriate. Don't worry if it sounds like a lot, you will feel like buying him a house! They are just that good. Have a look at the 'What to Wear' and 'Health Issues' pages on the website at www.slowtrekking.com for more detailed information. Also, read some trek reports from previous trips. There are lots of photos and you will see that many of our customers are not that young or athletic. It is called slowtrekking for a reason. You can reach me at teresadb@hotmail.com or vonschwichtenberg@gmail.com. Facebook page is Slowtrekking.